Rail Rush is a brand new game from Miniclip. It’s set in a mine and your character is in a cart that’s rolling through the mine. Your job is to avoid obstacles and collect gems and golden nuggets. Are you a fan of the classic battleship board game? If yes, then you’ll love playing Battle at Sea: Old Alert in your iPhone. The app has no fancy shows and no gimmicks, it’s a plain, easy to play battleship game and its simplicity is what leads to it scoring high marks. Battle at Sea: Old Alert is a iPhone game developed by ASH Applications and is available to download from the iTunes store for just 99 cents. The game, as I said, is simple and easy to play. Its interactive and as in the board game, strategy is the key here. If you think you could win by just randomly firing the grid, you will be amazed to see the computer beat you in a jiffy. The game comes with a multi player option which can be used to play with family or friends via either Bluetooth or WiFi. The layout is pretty similar to the board game, you position you fleet in the grid and hit go to play. In the app screen, once you’ve started the game, you’ll see a big grid where you’ll be guessing where the opponents ships are and firing at them. In the left you will see your own fleet and how is it performing. There is a small box in the bottom left of the screen which indicates the turn of play and a Captain or Pirates face screaming every time you’ve been hit or sink the opponent’s ship. The developer should take note that after some time the voice of the captain starts to get on your nerves. It would seem that you would do yourself a favor if you mute your iPhone while playing the game. Once you’ve sunk all the ships the game ends and is quite abrupt. There are no scores, no levels, no awards and even nothing to share about your achievements to say, even to your Facebook friends. That’s a bit disappointing given that the app is paid for. I would have liked additional levels or some added features like different bombing options or even a leader-board for scores to make it exciting. Nevertheless the game is addictive and if you liked the board game, I am sure you’ll love this one. You can download the app from the iTunes store from here. For some strange reason, iOS games that have something to do with food are always a hit in the App Store. Take Fruit Ninja for example, it’s success in the App Store has brought it to the Xbox and other popular platforms. Picnic Wars for iOS is no different as it is an extremely fun and emerging game which is based on food. The main goal in Picnic Wars is to plant, grow and shoot talking fruits at the opponent which is either the ‘fruits’ or ‘veggies’, whichever you choose. Both sides have different power ups and characters. Overtime you will earn seeds and bundles. You can use these as currency to purchase more plants and catapults which you will then use to bring down your enemy. To shoot at your enemy, you have to pick one of your planted plants and drop it in your catapult. You can then move your catapult and launch your plant. If you hit your opponent’s tower, it will take damage and eventually fall. Once the tower falls, you win the level you are currently playing. Your first few plants will be pre-planted and ready to use once you start the level. If for some reason you need more plants, all you have to do it tap on the bag of seed which will plant your remaining seed. Finally, Picnic Wars features 32 levels of combat in two different difficulties, easy and hard. While these two difficulties feature the exact same maps the only major difference is the difficulty and the food you play as. For instance, on “easy” you play as the fruits and on “hard” you play as the veggies. One of my favorite things about Picnic Wars is it’s amazing graphics. This game features very cartoon-like graphics with a really polished feel. To me, this really brings the game together and adds a very creative edge to the game. Another thing I’ve really enjoyed about Picnic Wars is the gameplay. It almost feels like an Angry Birds remix while maintaining it’s own originality. While this may sound strange in theory, It’s definitely a fun and addicting combo. 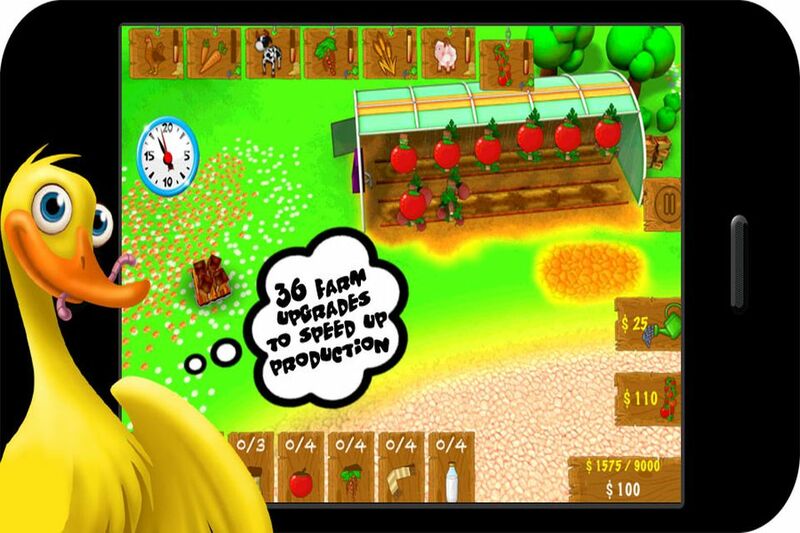 Farm games have always been a hit for the iOS platform because of their challenging yet simple objectives. While Farm 2 HD makes a good attempt at a farm game, it is ultimately crippled by a fatal bug. Below we have crafted a full review to help you decide whether or not Farm 2 HD is worth downloading from the iTunes App Store. Farm 2 HD features extremely nice graphics with a cool “3D” effect. While this may make the game pleasing to the eye, it also shows off one of Farm 2 HD’s biggest flaws; the animations. The animations in this game look cheap to me. This is because they are laggy and abrupt. Hopfully these shortcomings are fixed in a future update. The objective of Farm 2 HD is pretty simple, you must earn as much money as possible in a given time frame by selling crops and livestock. This will then allow you to then use your money to buy more land, livestock and seeds. Unfortunately, the shop which allows you to buy more land is currently broken so the game essentially stops after the first level. All in all, Farm 2 HD is too buggy to recommend. We can only hope these errors are fixed in a future update. If for some reason you would still to buy this game, you can purchase it in the App Store. While the Sim City series of games has always been fun, it has usually turned away casual players because of its intense rules. If you’re looking for a city simulator without all of the rules of Sim City, you may want to check out Virtual City 2: Paradise Resort. Your objective: complete all of the assigned missions and build the best city possible. Below, we have crafted a full review of this game giving you our full thoughts and whether or not you should pick it up in the Mac App Store. To start, Virtual City 2: Paradise Resort features cool graphics with a slightly “90’s retro” feeling. This definitely adds to the Sim City feeling of the game which will be a hit for fans of the classic title. While the graphics may be close to stellar, the user interface tends to be clunky and confusing when navigating through menus. For instance, the main menu is extremely cluttered with advertisements for G5’s other iOS games. Now let’s get into the actual gameplay of Virtual City 2: Paradise Resort. When you first launch this app, you will be prompted to start a new game. Once you’ve done this, take a look at the bottom portion of the screen. You will notice a bottom-bar which allows you to build things, view your objectives and control your trucks. The game revolves around trucks as you use them to either transport goods between towns or in between buildings in your city. Finally, you can also build different types of buildings which serve different purposes such as producing pizzas and corn. To me, this game is a great time killer. This is because each level is different and features a new set of extremely addicting goals and challenges. I would definitely recommend picking this game up once it hits the iTunes App Store for iOS. In the meantime, make sure to check out this game’s prequel, Virtual City. Entries (RSS) | Comments (RSS) | 92 queries in 0.854 seconds.